Colin and Maureen Binns in their truffière at Paengaroa. 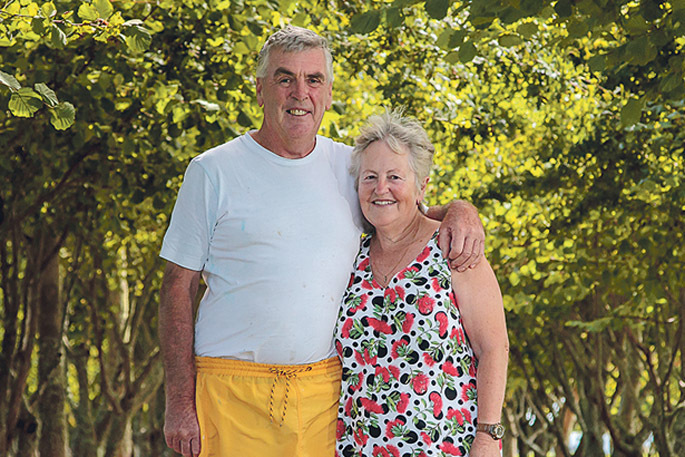 Maureen and Colin Binns have turned a small lifestyle block in the Bay of Plenty into a truffière. Relocating from Wellington nearly 15 years ago, they initially lived in Maketu, before discovering a piece of land tucked away near Paengaroa. Paddocks, an orchard, a lookout and an old airplane runway stand above 10 acres of native bush including rewarewa, with the 10 acres protected by a QE11 covenant. Below, the Mangorewa River flows northeast towards the Kaituna River. The idea of growing truffles came about because the previous owner was interested in them. In 2008, Colin ploughed 50 tonne of lime into a half-hectare paddock, helping pitch the right pH. Perigord black truffles require high soil pH – a minimum 7.8 – whereas bianchetto fruit at lower soil pH, between 6.5 and 7.3. Once the soil was prepared, they planted the trees – half of them oak and the rest hazelnut. “We had ordered several thousand dollars of little tiny sticks,” says Colin. “We had a couple of Dutch Woofers, who measured out the distances between where the sticks needed to be planted. This is now their fourth harvest – and Colin says growing truffles is a fascinating science. “It takes an awful long time to get a crop – it’s a bit like playing Lotto,” says Colin. “The trees grow truffles if they want to. They tread softly through the centre of the truffière in their Crocs, which they say help spread their weight evenly. The truffle fungus explores the soil for water and mineral nutrients, which it passes along to the tree. In exchange, the tree provides sugars produced through photosynthesis to the fungus. This interdependence between the tree and the fungus is subtle and fragile. Colin put pumice over some of the truffles that rose above the surface of the ground. The advantage of having ‘Jed’ the English springer spaniel, rather than a truffle pig, is that he’s not interested in eating the truffles once he’s found them. Colin enjoys the word association of the dog’s name with Jed Clampett, The Hillbillies, Texas tea – black gold. This year the couple is to visit truffle farms in Croatia, Italy and Eastern France. The couple have converted their sleepout into bed and breakfast accommodation for overseas truffle farmers. It’s now 10 years since Colin and Maureen planted the trees in 2008, and they’ve had three harvests since. “We harvest enough for us to have personally and to share with friends. We’re hoping for an increasing harvest.